Long ago, on the tiny Venetian island of Burano, the villagers were starving. Brave Gianni sets out into the icy lagoon to catch fish to feed his people, leaving his fiancée Nicoletta to pray for his safe return. Gianni tries to catch fish for hours, but his net comes up empty every time. A sudden storm sweeps across the lagoon, washing Gianni overboard. He struggles to stay afloat. 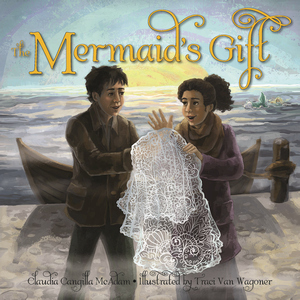 All hope seems lost until a beautiful mermaid appears in front of Gianni, bearing a gift that will change the lives of the people of Burano forever. This story is a beautiful adaptation of the Italian folktale of how Burano began crafting its famous lace. Rich, intricate illustrations by noted illustrator Traci Van Wagoner complement the delicate tale. Readers young and old will appreciate the resourcefulness and devotion of Gianni and Nicoletta in this title, destined to be a classic. Claudia Cangilla McAdam is the award-winning author of more than sixteen titles for children and young adults. She earned her bachelor’s degree in English from Illinois State University and master’s in theology from the Augustine Institute. McAdam’s writing—fiction and nonfiction—has been published in Highlights for Children, Fortune, Denver Parent, Catholic Digest, and many other publications. She is a member of the Society of Children’s Book Writers and Illustrators and lives with her family in Highlands Ranch, Colorado. Traci Van Wagoner earned bachelor of fine arts degrees in illustration and advertising design from Utah State University and in toy design from the Fashion Institute of Technology in New York. In addition to book illustration, Van Wagoner writes, designs toys and characters, and paints portraits. She is a long-standing member of the Society of Children’s Book Writers and Illustrators. Van Wagoner lives in New York City, where she and her husband run their product development company, Imagine That! Design.